Summer of 2000 saw a match made in heaven when ex-roommates Marshall Carnage and Josef Heresy decided to form Psyclon Nine. The band started out as a guitar driven industrial band, heavily influenced by KMFDM and Ministry, but the members soon altered their style towards the more aggressive sounding industrial inspiration of bands like Wumpscut, Velvet Acid Christ, and Suicide Commando. Shortly thereafter, the band came together as a whole when Eric Gottesman, the frontman for See Colin Slash joined Carnage and Heresy. In 2003, Psyclon Nine released their first album Divine Infekt, on Noitekk. The debut album gained the band popularity very quickly with its extremely fast paced music and lyrics. Over the course of their previous albums, Psyclon Nine has continued to evolve into its own sound, implementing elements of black metal, post-punk influences, metal, and industrial. Now, after three years of silence, Psyclon Nine returned in 2009 with We The Fallen, its darkest, most aggressive album to date. For We The Fallen, Psyclon Nine has enlisted the help of Jason Miller (GodHead) for final tracking and mixing. Dark electro doesn’t get much more evil than this. In the darkest form of incubated evil, a symbol has been born to strike immense shock and fear into the hearts of mortal weakness. 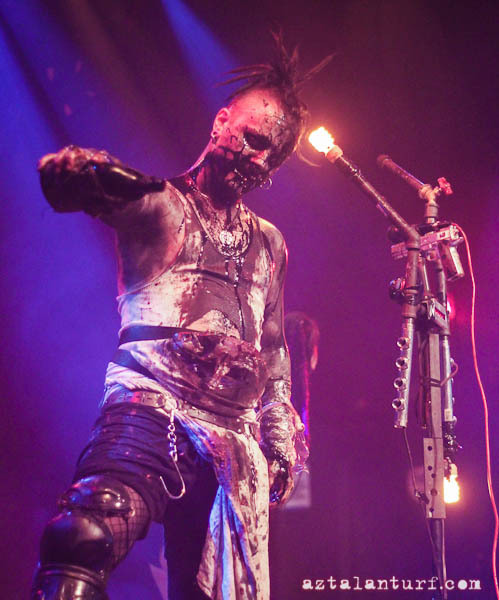 Kristof Bathory is the icon which has made a new era where nightmares become reality and where the sounds of the macabre shall emerge from a catastrophic symphony. Dawn of Ashes has resurrected the sounds and visions of horror, hatred, sexual perversion and other shocking content that is spewed forth in the form of Industrial metal / Shock Rock which was created to reflect upon the birth of death, impurity and failure. Now the plague has come to corrupt the flesh of man. Dawn of Ashes has been an established act that has been on various record labels through out the years. Since 2001, Dawn of Ashes started off as a Horror-Industrial act and as the years progressed so did the sound. DOA has always had a strong influence from Metal, Rock & other aggressive forms of music which made the band stand out. Now, the group has incorporated elements from Metal, Rock & Industrial with a new twist of evil. Welcome to this breathing vision of Hell. Promidal opening for Leaether Strip, July 11, 2013. Photo: aztalanturf. 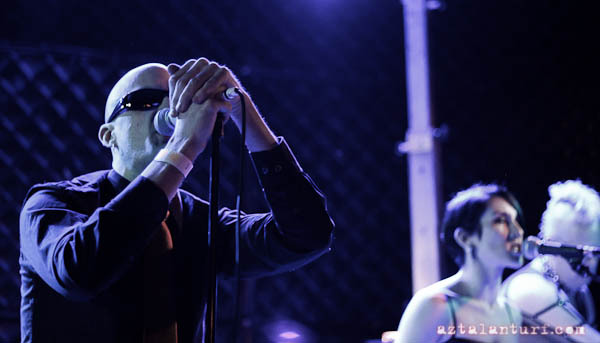 In the fall of 2010, three members of a Minneapolis-based synth-punk band decided to form a side project to allow them to play more live gigs. The new band would be harder and draw more heavily on the trio’s love of industrial and electronic music. A few months later, as|of was born. The name is meant to embody the idea that the forces and conditions that affect a being ‘as of’ one moment in time can change drastically ‘as of’ the next. The band’s self-titled first album was released in the spring of 2011 and is available at Radio-Active-Music.com. 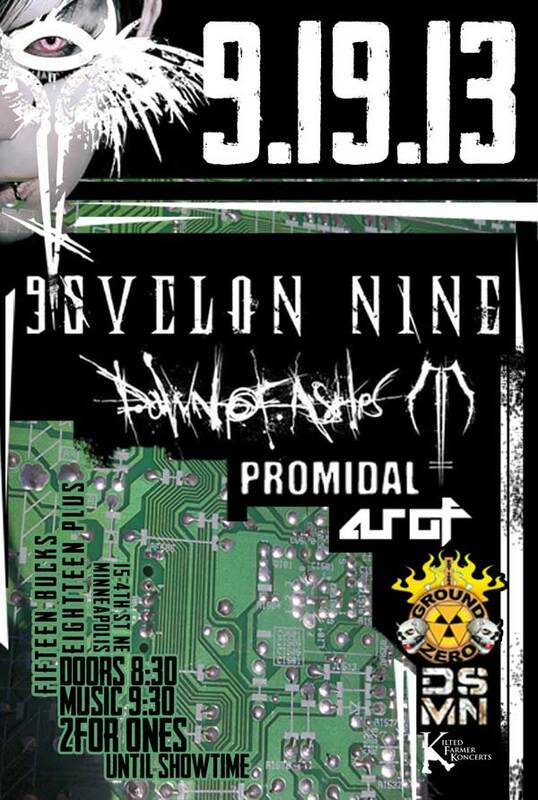 This entry was posted in KF Concert Info and tagged aggrotech, as|of, concert, dawn of ashes, ebm, gore, ground zero, industrial, minneapolis, promidal, psyclon 9, psyclon nine, terror ebm, twin cities. Bookmark the permalink.